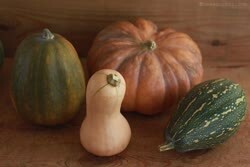 #06 (green pumpkin - Kururu, next - Golden Hubbard) Every year I check also possible pumpkin 'new products'; and although after so many years of buying a pumpkin, most of the varieties available here are already well known, and from time to time I still manage to spot something new. 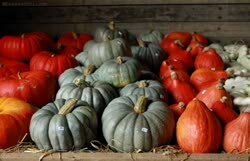 This time it was, for example, Kururu pumpkin ( Cucurbita maxima ), from the Hubbard pumpkin family. These are specimens of rather large dimensions, often weighing from 10 to 15 kilograms, and like the other Hubbards - with dry, compact flesh. 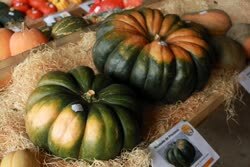 #08 Crown Prince ( Cucurbita maxima ) is a very tasty pumpkin from Australia and New Zealand. 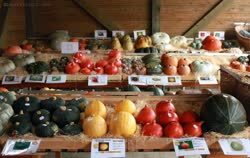 The fruits are gray, round and slightly flattened (on average from 4 to 8 kg); the flesh is pale orange, quite dry and compact, of very good quality. It can be stored for up to 8 months. 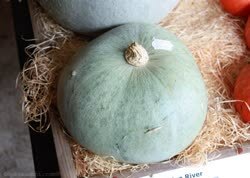 #09 Another Australian beauty is Triamble - also known as Tristar or Shamrock ( Cucurbita maxima ), which I showed for the first time on the blog five years ago - click ( excuse the quality of those photos;) ). 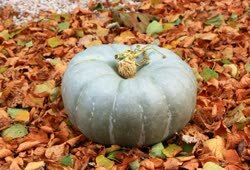 It is a gray-blue, former pumpkin variety with an extremely original triangular shape. The pulp is dark orange, compact, very good quality. 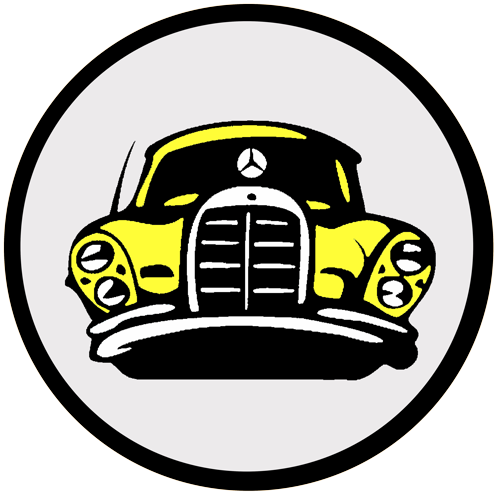 It can be stored without problems for up to a year, and even longer in optimal conditions. 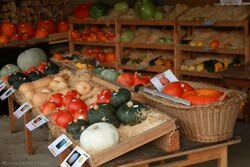 #10 Another of the varieties, which is not scary, is the Hungarian Nagydobosi Sut�t�k ( Cucurbita maxima ) that I host every year , just like the previous one - exceptionally tasty. 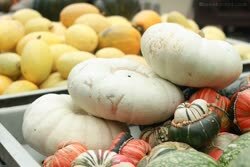 It has gray-blue fruits weighing 4 to 9 kg and yellow-orange flesh of very good quality. It can be stored for up to 7 months, in optimal conditions even longer. #13 Australian Butter is an Australian variety with an orange-pink peel and orange, quite compact pulp (weight about 5-6 kg). It can be stored for up to 3 months. 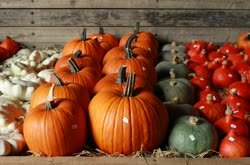 #14 In the season I always buy a few pieces of macaroni pumpkin ( Cucurbita pepo ). It has oval fruits (an average of about 1.5 kg), a light yellow pulp, after cooking / baking, separating into 'threads' (hence its second name - 'spaghetti'). 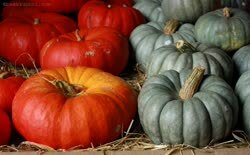 For reasons of taste, this is not my favorite variety, because there is too little 'pumpkin';), but for this reason often tastes to those who do not like pumpkin ( after all, every monster ...; )). 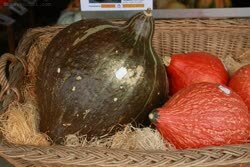 #21 Although it is the most edible pumpkin, its taste, unfortunately, is not unique; as in the case of Rouge vif d'Etampes pumpkin ( so-called "Cinderella Pumpkin" ), if I had to use one of them, only with the addition of other pumpkin or other vegetables, for example in the form of soup ( with a lot of spices;) ).